Heat emergencies are of three types: heat cramps (caused by loss of salt), heat exhaustion (caused by dehydration) and heat stroke (shock). Remove the victim from the heat and have him lie down. 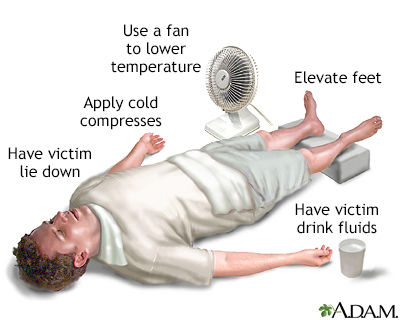 Apply cool compresses, elevate the feet, drink fluids and use a fan to blow cool air. Get medical help if needed.